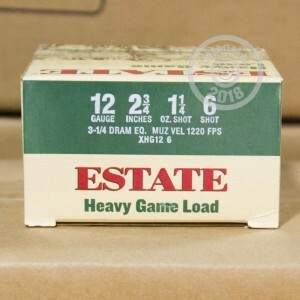 Whether your quarry is small game, upland birds, or clay targets, you'll appreciate the reliability and low cost of this 12 gauge Estate ammunition. 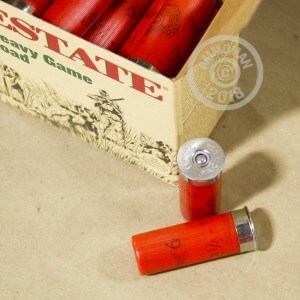 These shotshells come in boxes of 25 and fire 1-1/4 oz. of #6 birdshot at a muzzle velocity of 1,220 feet per second. This is a relatively low-recoiling load that produces good results at medium range due to the heavier pellets used. Estate ammunition is loaded in Anoka, Minnesota by Federal Premium Ammunition. Both brands are division of the Vista Outdoor group. Place an order for $99 or more at AmmoMan.com and get the whole thing delivered to your doorstep at no additional S&H charge!